Washita County, located in the southwestern part of Oklahoma, is bisected by the Washita River. There are about 1,300 Mennonites living in the northeast section of Washita County, and a few families in adjacent Custer County. Of these about 900 are Mennonite Brethren (MB) and about 400 General Conference Mennonites (GCM). Washita County, a part of the Arapaho-Cheyenne Reservation, was opened to settlement in 1892. The first Mennonite settlers came in the latter part of 1892, filing for land with the intention of moving here the following year. In the spring of 1893 the first families moved into the county from Kansas. There are four Mennonite churches in the county, two each of MB and GCM. A number of Mennonite Brethren families and a few Mennonites started the Calvary Baptist Church a few years ago. The MB Church has a four-year accredited academy, located in Corn, which draws students from all over Oklahoma and beyond. Hege, Henry. "Washita County (Oklahoma, USA)." Global Anabaptist Mennonite Encyclopedia Online. 1959. Web. 21 Apr 2019. http://gameo.org/index.php?title=Washita_County_(Oklahoma,_USA)&oldid=93865. Hege, Henry. (1959). Washita County (Oklahoma, USA). Global Anabaptist Mennonite Encyclopedia Online. 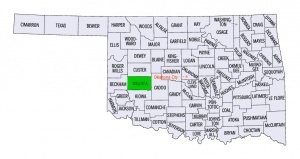 Retrieved 21 April 2019, from http://gameo.org/index.php?title=Washita_County_(Oklahoma,_USA)&oldid=93865. Adapted by permission of Herald Press, Harrisonburg, Virginia, from Mennonite Encyclopedia, Vol. 4, p. 894. All rights reserved.